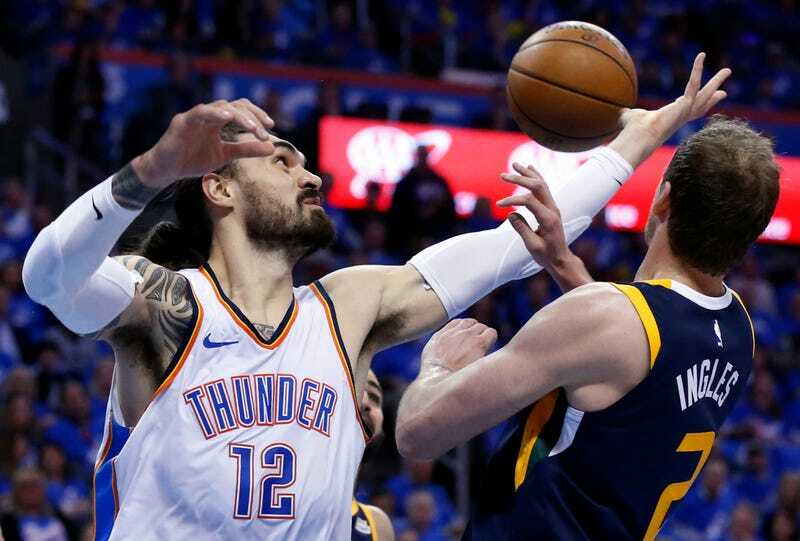 To refresh your memory, Steven Adams rammed in an alley-oop in Game 1 of the Thunder’s playoff series against the Jazz that made a satisfying thunk, but also rendered his right arm unusable. It just sort of hung there for awhile. Adams, who is right-handed and typically takes tips with his dominant hand, faked right before going up with his left to start Game 2. He played 22 minutes, notching nine points, seven rebounds, and spending some stretch of fourth quarter off the bench, apparently in the locker room, before returning to the game and eventually fouling out. A band of black kinesio tape ran along the side of his right arm. The center was in no mood to elaborate, telling ESPN’s Royce Young that he was “still above ground so can’t complain, mate,” and coach Billy Donovan also denied that Adams had an injury issue. Yes, it’s the playoffs, and every shred of information might be made useful by the enemy, but also, the evidence is being broadcast on national television. Steven Adams sure looks injured, and the Thunder aren’t fooling anyone.